US sitcom One Day at a Time returns to Netflix for its third season tomorrow. A reimagining of the Norman Lear classic, this centres around a Cuban-American family and features Justina Machado and Rita Moreno. The original series ran for 9 seasons from 1975 until 1984 with Bonnie Franklin as a divorced mother raising two teenaged daughters in Indianapolis. Our heroine is a recently separated, former military mom (Justina Machado) navigating a new single life while raising her radical teenaged daughter and socially adept tween son, with the “help” of her old school Cuban-born mom (Rita Moreno) and a friends- without-benefits building manager named Schneider. The 13-episode first season of One Day at a Time is produced by Act III Productions, Inc., Snowpants Productions and Small Fish Studios in association with Sony Pictures Television. Norman Lear, Mike Royce, Gloria Calderón Kellett and Michael Garcia are executive producers. Friday February 8 on Netflix. 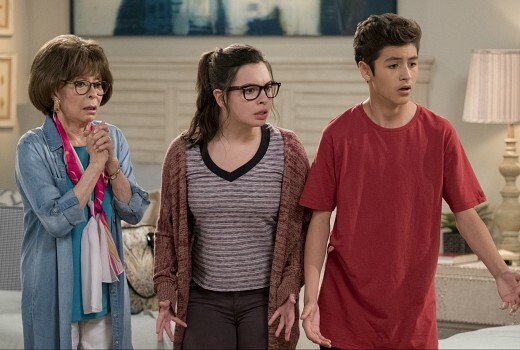 Came across ODAAT by chance & I’ve absolutely fallen in love with it & it’s characters. I can see why critics so why it is universally critically acclaimed & include it on their end of year lists. How often does a sitcom have an EGOT as 1 of the lead, let alone Gloria Estefan, Melissa Fumero & Stephanie Beatriz all in 1 ep? The show is so important for it’s diversity, and just gets better with age. It’s rare in that it can make me laugh & cry at the same time. It’s also given 1 of my all time fave tv couples. The live studio audience adds to the atmosphere during the serious parts. Decider even calls it the most important show in Netflix history. The writers will bring in people to speak to them about the various topics – such as Todd Grinnell & his sobriety, healthcare workers etc. The 2 showrunners, Gloria & Mike are quite responsive on twitter too.